Second graders at Fairley Elementary School ventured into Cayuga County on Oct. 17 to visit the Sterling Nature Center. 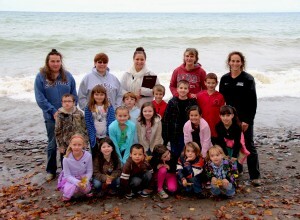 Pictured is Stephanie Griffin’s second grade class in front of Lake Ontario at the Sterling Nature Center. Students sounded out the word Ontario, and determined that it had four syllables. The nature center has over ten miles of hiking trails and two miles of lake shore. Stephanie Griffin’s second grade class started their day with a teacher-lead lakeside trail walk. Along the walk, students were asked to look and listen to nature sounds, and pick up three leaves to use later in a leaf rubbing session. The second graders kept a safe distance as Lake Ontario’s rolling waves crashed into the rock shoreline. Students learned that rocks near the water’s edge are smooth and flat, the perfect shape for skipping. Other rocks found near the Great Lake contained fossils. Madison Engle, a student of Lisa Bailey’s at Fairley Elementary School, holds up her completed leaf rubbing picture. Students collected the fall leaves on their nature walk, and used a crayon to gently color a piece of paper over the leaf. Students were fascinated by two trees on the shore that had been overturned, roots exposed. Before breaking for an outdoor bagged lunch under the pavilion, students toured the visitor’s center. Inside, they saw preserved animals, animals that they could find in their own backyards. Griffin’s students were particularly interested in the coyote and flying squirrel on display. Second graders also went on a nature walk with guide Jim D’Angelo. Students in Lisa Bailey’s class trekked down to the rookery, where the herons nest. Ducks, a beaver dam, and a bald eagle were all spotted on the trail. 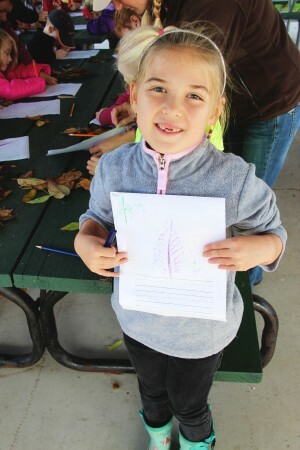 During the second session, Bailey had her class do leaf rubbings, and habitat relay races. Each student picked a plastic animal toy, and had to categorize the animal into its natural habitat, either water, forest or field. 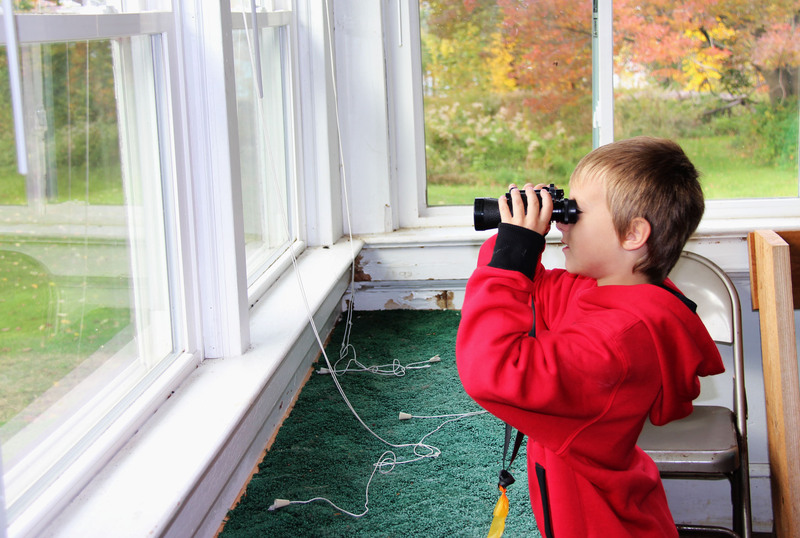 Ian Shoults, of Stephanie Griffin’s second grade class at Fairley Elementary School, uses binoculars in the visitor center at the Sterling Nature Center. Students took turns sharing the binoculars, and looked for birds in the trees. The leaf rubbings were done at the picnic tables with crayons. Students placed a leaf on the table, covered it with a sheet of paper, and used the side of a crayon to shade the leaves veins. They were then asked to write a sentence about its texture, or what tree the leaf came from. Transportation for the field trip was paid for through a grant from Novelis. Home and School also provided a portion of the cost.